Carol DeSantis has recently published an important paper entitled “International variation in female breast cancer incidence and mortality rates” in Cancer Epidemiology, Biomarkers & Prevention. DeSantis is with the American Cancer Society in Atlanta while her collaborators are based at the International Agency for Research on Cancer (IARC), located in Lyon, France. Recognizing that breast cancer is the most frequently diagnosed cancer and the leading cause of cancer-related death among women worldwide, the authors examined global trends using the most up-to-date information available in the IARC and WHO databases. Here’s what they found. While breast cancer has usually been considered a disease that primarily affects Western women, the researchers reported that 52% of new cases and 62% of deaths now occur in economically developing countries. Among the risk factors suggested to explain the increased incidence associated with urbanization, were: changing diet; obesity; physical inactivity; delayed childbearing; fewer children; and shorter periods of breastfeeding. 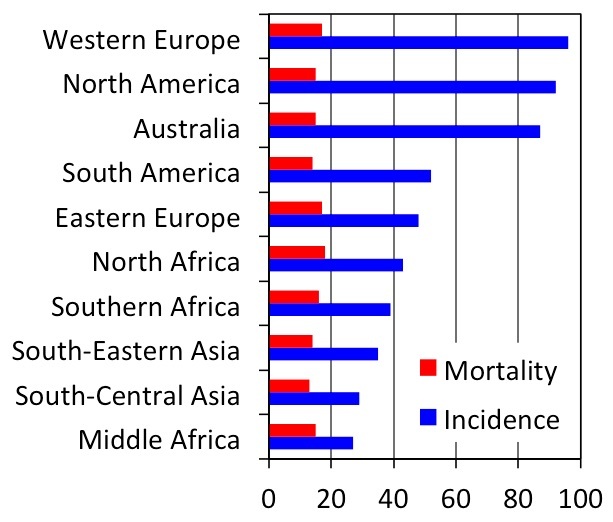 In analyzing the trends for 32 countries from 1993 to the present, the authors found that in the recent period the rates diverged – with incidence increasing and mortality decreasing – in nine countries located mainly in Northern and Western Europe (rates per 100,000 in diagram at right). As might be expected, all these countries have had state-sponsored mammography screening programmes in place for the past two decades. In ten countries, however, both the incidence and death rates have increased. While most of these would be considered economically developing countries, there was one notable exception: Japan. One of the developing countries with a large and increasing cancer burden is China where the health authorities have just announced a public health campaign that over the next three years will see an expansion by one-third of screening for early detection. In addition, there will be a focus on cancer prevention – particularly related to smoking, which is widespread – as well as support for new drugs. The China Food and Drug Administration (CFDA) will have a vital role to play by approving these drugs as well as novel screening platforms such as CapeRay’s dual-modality Aceso system.